The 2018 Maruti Ertiga has started reaching dealerships ahead of its launch on 21 November. 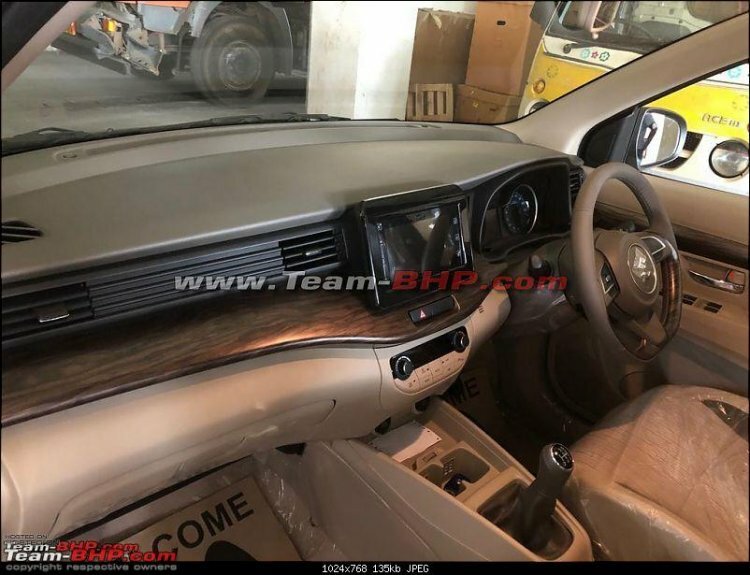 Here are fresh images of its exterior and interior, shared by Team-BHP's Leoshahi. 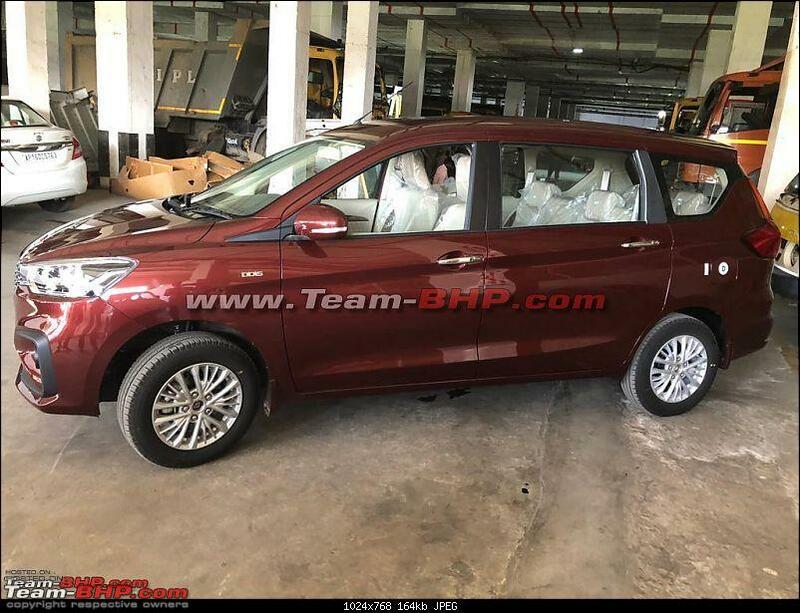 The fully-specced 2018 Maruti Ertiga (Z) is painted in the Pearl Metallic Auburn Red that is new for the second generation. It is equipped with features like projector headlamps, chrome-studded front grille, 15-inch alloy wheels, tail lamps with LED lighting, faux wood trim on the dashboard and steering wheel, beige seat upholstery, recliner third-row seats, touchscreen infotainment system and automatic climate control. The second generation Maruti Ertiga has a more elegant design and is bigger. It sits on the familiar Heartect platform and while the previous platform had segmented frames, the new underpinning has connected frames that increase the lower body stiffness. The body frame is made mostly of ultra-high-tensile steel, which has resulted in a weight reduction of 6 kg (in the Indonesian-spec Suzuki Ertiga). The 2018 Maruti Ertiga is available in 10 different configurations. The 2018 Maruti Ertiga comes with the all-new K15B 1.5-litre petrol engine and the older D13A 1.3-litre diesel engine. The new petrol engine, a naturally aspirated mill, debuted in the facelifted Maruti Ciaz in our market, and internationally it powers even the fourth-gen Suzuki Jimny. It would come in the same tuning as the Indonesian-spec 2018 Suzuki Ertiga, 77 kW (104.7 PS) at 6,000 rpm and 138 Nm at 4,400 rpm. However, here this engine will feature a mild-hybrid system for higher fuel economy. It will send drive to the wheels via a 5-speed manual transmission or an optional 4-speed automatic transmission. The D13A 1.3-litre diesel engine, coupled to a 5-speed manual transmission, will have the same tuning as in the outgoing model: 66 kW (89.74 PS) at 4,000 rpm and 200 Nm at 1,750 rpm. However, like the petrol engine, it will feature the mild hybrid system that has two batteries. The outgoing model’s D13A engine features a single-battery mild-hybrid system. Interested customers can pre-book the 2018 Maruti Ertiga for an amount of INR 11,000. The 2018 Maruti Ertiga is likely to cost around INR 7 lakh (ex-showroom) onwards.